I knew we were being ambitious when "Read Story of the World" made it onto our lists of goals at the beginning of the summer. And ambitious it was. When we finished it over the weekend, there were cheers and smiles and a general feeling of major accomplishment. We had done it. By chipping away at it a little every day, we had done it. 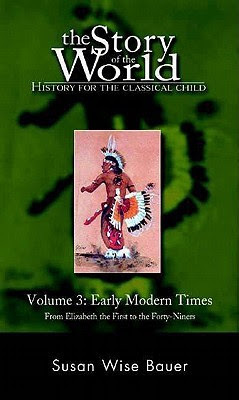 We read volume three, which covers the two hundred and fifty years between Elizabeth the First and the Forty-Niners (1600 to 1850). I didn't purposely choose to skip volumes one and two. It's just that volume three was the one that was available from the library when we were ready to start, so that's what we went with. It was daunting not only because of its length (nearly 400 pages) but also because of its content (although by reading volume three, it meant that at least there were a few historical figures, like George Washington, that my kids were already familiar with). Even though it's written for elementary school-aged kids, it's still fairly dense and detailed. It covers the globe, traveling from England to America to China to Russia to Australia and back again. It talks about dozens of different people: some with crazy hard names like Aurangzeb or K'ang-hsi, some with nearly identical names like Louis the XIV and Louis the XVI, and some blessedly familiar names like William Bradford or Patrick Henry. The whole point of reading this book was to broaden our world view and introduce us to significant historical events. But before we even read the first chapter, I could see we were going to be in trouble fast unless we did something to help organize and keep track of the abundance of names, dates, and places. So we created a timeline. It wasn't anything fancy. I splurged and bought a pack of index cards (and marveled that you can still buy something that isn't a pack of gum for under a dollar). Then Aaron and Max took turns drawing their interpretations of the events we were reading about. And then we taped the card to their bedroom wall. Done. The chapters were divided into sections that were each about three to five pages long. This seemed to be the perfect amount of information for each drawing. If it had been any longer, it might have been difficult to narrow it down to one picture. 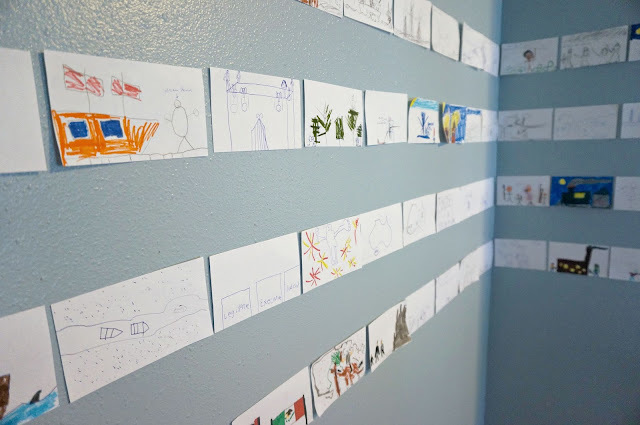 Sometimes I would help them think about what they could draw, but the artwork itself was all one hundred percent theirs. Often times it didn't look anything like what I envisioned, but it didn't matter. Their own personalities and styles really came through in the pictures. 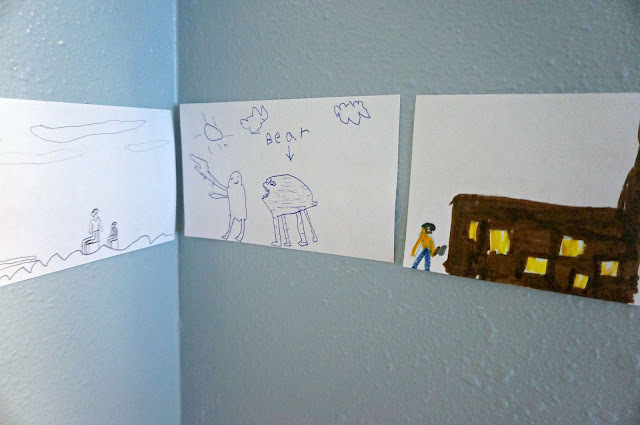 I love this wall so much because it's something tangible that I can later take down and keep to help remember our summer and the current stages of my kids (by next summer, I'm sure their artistic styles will both have changed). Plus, my own knowledge of world history grew so much while reading, and I'm really grateful for that. 1600 to 1850 covers the time period when so many countries decided to declare their independence. There was the American Revolution, of course, but also the French, Haitian, Venezuelan, and Mexican Revolutions (among others). Seeing all of these revolutions all lined up next to each other made me realize again what an absolute miracle it was that the American Revolution was such an overwhelming success. Not only were they able to successfully break away from England, but they also set up a government system based on equality and freedom that is still going strong today. The revolutions of so many other countries failed because they were driven by power and greed. They were done in the name of freedom, but in the end, they couldn't figure out how to run a country without a dictator. And sometimes, just trading dictators didn't leave a country any better off than what it was like originally. Reading about this period of history made me so grateful for the country I live in and for the founding fathers who weren't greedy for power. One of Aaron and Maxwell's favorite stories was about Marie Madeline, a young 14-year-old girl who defended a fort in the French colonies. The Iroquois Indians attacked it, and almost everyone in the fort cowered in fear. But Marie Madeline, along with her 10- and 12-year-old brothers and an 80-year-old man, held the fort for eight days. That's the kind of stuff you could expand into its own novel. And it's for that reason that I was so impressed with this book. Every chapter covered an important event in the history of the world. Entire books could be, and have been, written on each subject. It's an overwhelming amount of information to try to condense into a single volume. I can't imagine the amount of research that went into it and how time consuming, and at times frustrating, it must have been to try to determine how to tell such a big story in just a few words. But Susan Wise Bauer did just that, and I feel like the boys and I really accomplished our purpose in reading this book. We're not history buffs, but we're a lot more knowledgeable than we were before we started. I love seeing my kids' faces light up when they overheard a now-familiar name, like Louis the XIV or Frederick the Great, and they exclaim, "Hey, I remember him!" I am SUPER impressed! Seriously. This. is. amazing. You bonded and learned and achieved. I absolutely love it. Also, I've never heard of this series! And now I'm very intrigued...definitely going to remember this for future summer reading. Thanks and happy fall! This is awesome! And seriously an accomplishment! I love the idea of drawing the timeline. The timeline was definitely the key to our success! 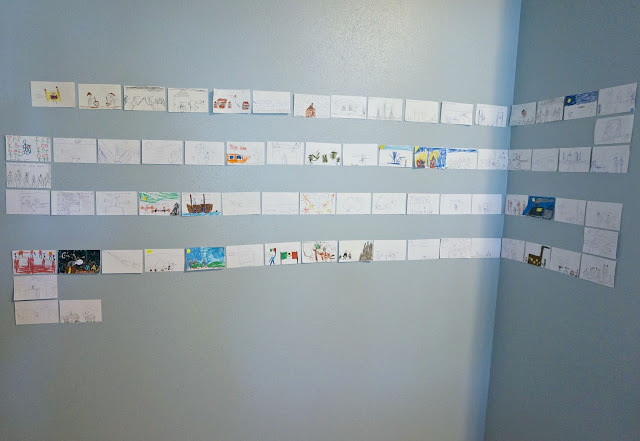 Ooo -- you could get smaller index cards and as you read more history (or historical fiction) make an illustration for the book and use yarn to link them to the right spot! (Clyde Bulla has a bunch of historical fiction and was a brief craze for my son in 2nd grade). If your boys aren't scared by book about girls (my boys weren't) there are a lot of good historical series (Dear America for example). And the Magic Treehouse and Time Warp books, plus all the regular historical fiction. I like it! And thanks for the other great recs! What a terrific idea! I've been hemming and hawing about how to help my son remember what he reads in SOTW 2, and this is perfect. Thank you so much! Oh good! I'd love to see a picture of your own timeline if you end up making one!